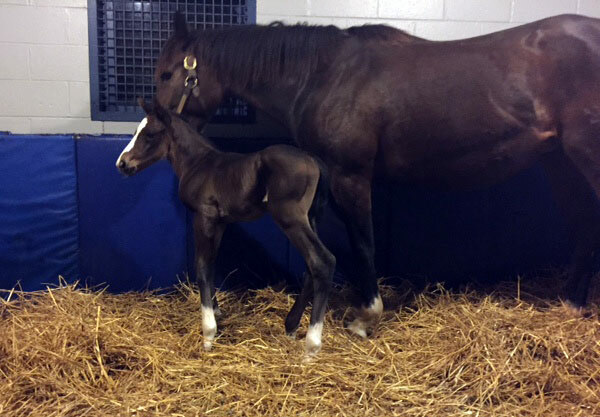 US Triple Crown winner American Pharoah is a dad, with a colt foal born at Brookdale Farm in Versailles, Kentucky in the early hours of Tuesday morning. The youngster born at 12.30am from the Tizway mare Kakadu is the first reported progeny of the great galloper, and with his bloodlines, should be very fast indeed. His mum is a half sister to multiple group winner Protonico, and from the female line of Chilean champion and group 1 winner Wild Spirit. “It’s very exciting,” Brookdale Farm’s Fred Seitz Jr. said of the colt. “For a first foal, he’s a very nice, very attractive type. Personality wise, I think he seems like he’s going to take after his dad with that mellow-type personality. Most babies are kind of skittish and want to run around behind their mother but he’s not that type. You walk in the stall and he comes right up to you and starts chewing on your hand. He seems to be real bold and have that fun personality. American Pharoah, who was the first Triple Crown winner in 37 years, stands at Coolmore’s Ashford Stud, also in Versailles. He won nine races and almost $US9 million in his career. He had 47 mares confirmed in foal in his first season, all group one winners or producers.